Channel 4's Time Team series pits two differing views of the West Saxon colonisation of Hampshire against one another. Robin Bush's fascinating account of how the West Saxons conducted genocide on the Jutes of South Hampshire meets Helen Geake's response. The traditional view is that the area of Hampshire covered by the Time Team Live dig, as recorded by the Anglo-Saxon Chronicle, is where Cerdic and his son Cynric landed in AD 495 and, after a battle at Cerdicsford (erroneously identified as Charford), established the Kingdom of Wessex. In 1989, and in a succession of subsequent publications, Dr Barbara Yorke put forward an alternative theory, which has met with general acceptance (I cannot find any historian or archaeologist that disagrees with her conclusions). She maintains that the Chronicle, first written up in the late ninth century, wanted to suggest that the West Saxons had been in control of their later heartland from the beginning. In reality Cerdic and Cynric, if they ever existed, operated in the Thames Valley, where their original bishopric was located at Dorchester-on-Thames. They only established their principal see at Winchester as the Mercians forced them to move south and west in the seventh century (circa 660). Bede, writing much earlier than the Chronicle, in 731, records that the areas of Hampshire and the Isle of Wight were occupied, probably from the fifth century, by the Jutes, who also colonised Kent. They continued to hold this region, possibly as two kingdoms, until circa 686, when the Saxon king, Caedwalla, moved south, killed their last (and pagan) king, Arwald, and captured his two younger brothers. These he allowed to be converted to Christianity before executing them. Independently supporting this theory is the fact that Caedwalla's Saxons were known as Gewissae until this conquest and that only after 686 did they call themselves West Saxons. Further support is given by the fact that Florence of Worcester refers to the New Forest as 'Ytene' ('of the Jutes'); that Bishopstoke on the River Itchen was formerly known as 'Ytingstoc' ('the settlement of the Jutes'); and that a lost hamlet on the river Meon also bore the name 'Yte Dene' ('Valley of the Jutes'). Bede also refers to the Hampshire mainland as 'the nation of the Jutes'. 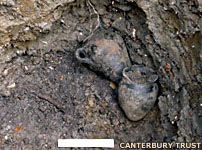 Archaeology now supports these conclusions, as one of the only other Byzantine buckets was found in the sixth century cemetery of Chessell Down on the Isle of Wight - also held by the Jutes. As the cemetery excavated by Time Team is firmly dated to the sixth century, it can only be Jutish as there were no Saxons in the region until over a century later, when Caedwalla did his best to exterminate all the Jutes living in those areas and replace them with his own tribesmen (Bede) - a peculiarly nasty example of genocide and ethnic cleansing. As far as the place names pointing to Jutish settlement are concerned, they are ringed around the outer limits of the Jutish kingdom and probably arose to show its borders. After all, if everyone is Jutish, there's no point in calling a settlement or river or whatever the 'Jutish' one - they're all Jutish. And our site was near Salisbury - beyond the area called Ytene, the 'land of the Jutes'. But my wider point is this. Robin takes Barbara Yorke's evidence (selectively in my view) to show that there was a kingdom in Hampshire and the Isle of Wight, from the fifth century onwards, entirely populated by people whose ancestors lived in Jutland. I take it (probably selectively in Robin's view!) to show only that there was a kingdom or kingdoms there in the seventh century ruled by a family who thought of themselves as Jutish. For the sixth century (the period of our cemetery) we have to accept the archaeological evidence. The archaeological evidence for population in Roman Britain (England) now suggests that it was as high as the population just before the Industrial Revolution - about three to four million. This is far too many for migrating Germans to have swamped and over-run in a century - the North Sea would have had to be solid with ships. So the mass of the population in the sixth century would have to be descended from the Romano-British - the same people who'd been living there for many generations. The evidence shows that it could have been just the aristocracy, the rulers, who arrived from the Germanic areas. The mass of the people merely had a cultural change - they decided to wear the new Germanic fashions and even to speak the new language of power (as indeed we see later in Cornwall and many other places where English overcomes the native tongue). But even if they aren't Jutish by ancestry, can we say that they'd decided to try to look Jutish, and therefore we can call them by that name? Or should we use a more general term such as Anglo-Saxon? Well, there's little that's specifically Jutish around. The only objects that have been used in England to define Jutes are pottery, and some decorative motifs on brooches. We don't have any of this at our site. And there's very little even at classic sites such as Chessell Down on the Isle of Wight. The mass of the people look just vaguely Germanic. History tends to tell us about the great and the good, and archaeology tells us about the ordinary person. So while the royal family of the Isle of Wight may have really been Jutish - and their wiping out could be called ethnic cleansing - the people they ruled were just Isle of Wight people, wearing the prevailing fashion and being buried in the way that they thought would benefit their family most. 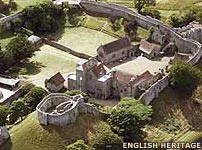 The ruins of Carisbrooke Castle on the Isle of Wight, probably overlaying the earlier Jutish capital.